A New Year is upon us, which often leads us to a desire to improve areas of our lives. I would love to encourage you to consider incorporating play therapy to improve your child’s life. In the photo below, you are able to view transformative play. This young elementary student started with the blocks and processed through several creative ideas of what could be created with them. These ideas ranged from a mansion, to a pool, ice skating rink, and finally a car race track. With each idea considered, the client is using innovation and problem solving skills. The child is in control of choices and feeling empowered. 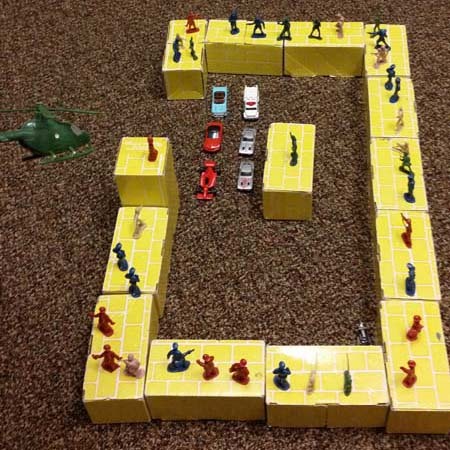 After a car race track was settled upon, the child furthered the creation to include details. Does the race track need a restroom, pits, etc? This awareness of details translates to a practice of your child’s processing the small details in “real life”. The child’s brain in engaged at this point and strengthening/creating pathways in the brain. Then, the child spontaneously grabbed a bucket of army soldiers and began incorporating them into his play. Soldiers don’t necessarily belong at a race track, so each soldier was viewed and transformed. The soldier laying on the ground with his rifle was transformed into a pit crew member working on cars. The soldier shooting a gun in the air was assigned the task of starting the race. The soldier holding an ax was transformed into the flag waving guy at the race. And this process continued. Once the race track was completed, the child was able to use it to process current issues, work on problem solving, and social skills. Through this transformative play process, the child was able to take a situation and realize that, not only was self-control and empowerment present, but that a transformation in your thinking is not only possible but practical. This shift in cognition is the basis of battling anxiety and depression, and through play this child was able to practice and accomplish transformative thought. Play therapy is a powerful process where children are able to work on the problems of today while strengthening the skills for tomorrow by using the language they know best to express themselves, play. If you would like to discuss the benefits of play therapy on a more individualized level, please feel free to contact me today. 214-310-8826.